The herbivore clothing company was founded in 2002 by Josh and Michelle from their spare bedroom in Portland. The couple had the idea of producing ethically made clothing that not only looks good, but is also free from animal harm. Their business started with just a simple website and a very limited product range of vegan shirts. However, both of them had lots of ideas for the future and how to grow their venture into a massive success. After setting up their website, Josh and Michelle spent a few years shipping clothing all over the world from their spare bedroom. Initially starting with just vegan shirts and hoodies, the couple quickly expanded their range to cruelty-free belts, bags, and wallets. As of today the company now sells a whole range of vegan and cruelty-free clothing including stickers, buttons and baby clothes. As their product range started to grow so did their team and relationships. In 2007, Josh and Michelle teamed up with Lisa, the founder of Sweetpea baking company. As well as Chad and Emiko of food fight vegan grocery, and Brian and John of scapegoat tattoo. Together they all moved into SE 12th and Stark streets, which is now known as the vegan mini-mall. 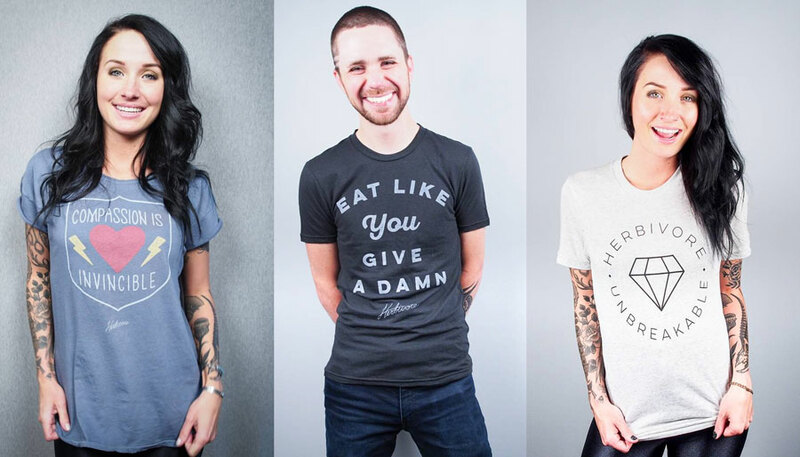 The herbivore clothing company’s core belief is that you can look fashionable while wearing ethically made clothes, and without harming animals. Just from looking at their clothing range, we’d have to agree with them! Not only are their clothes fashionable and high quality, but they’re also not ridiculously priced. It’s also important to remember that the herbivore clothing company also helps other local businesses and charities with their services. To increase their brand exposure, the herbivore team regularly host and attend vegan events and conferences around the United States. In 2018 alone herbivore clothing company is scheduled to appear at over 18 different vegan festivals around the US. Not only are they producing also ethically made clothing, but they’re also sharing their clothes and vision around the world. At the same time, the herbivore clothing company is so much more than just an online shop. When they’re not selling cool ethical clothing, they work with a range of other companies to support their work. They’ve also donated their time to various sanctuaries, and have helped raise money for plenty of animal-rights charities around the world. With so much love and caring at herbivore, it’s clear to see why they’re such an excellent vegan clothing brand. We highly suggest you check out their website and pick up some of their merch. Not only will you feel good knowing that your clothes are ethically made, but you will also be supporting various animal-rights charities. Want to find loads of other cool vegan shirts and brands like the herbivore clothing company? Don’t worry; there are plenty of them out there! Check out our full list of vegan shirts and vegan brands for more awesome ethically made clothes.